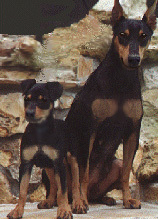 The German Pinscher was the mid-sized foundation-breed used to create the more popular smaller Miniature Pinscher and larger Doberman Pinscher. Although they share similar characteristics, there is more of a difference between the Doberman, Miniature or German Pinscher, than mere size. Dog Poems and Jokes, Rescue, Events and Shows, and Health. You will see MANY GPs on the following pages. Some are mine like WWKC CH Kinrha Hinnie Joy C.G.C. "guarding" my pool in the Lake Applet to the right. Many belong to the subscribers on the maillists. Learn what makes them a unique and "rare" breed. Oh dear - no Java!!!! Welcome to one of the most complete and informative German Pinscher sites on the web, devoted to preserving the health, temperament and genetic integrity of the German Pinscher. The links on the following pages will take you to *PICTURES* -- the FCI and world-wide written standards, the history and description of the German Pinscher, the Doberman and the Miniature Pinscher. Although this webpage is in English, many links are in the native-tongue of the country of origin, especially in the Description [written standards] and Directory pages of German Pinscher Owners and Breeders Around the World. 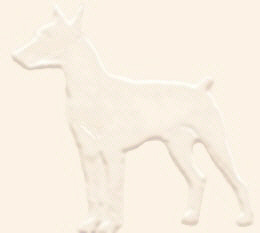 Join our German Pinschers Around the World mailing list!